My teaching/advising duties are stretching me thin today, so I’m a bit slower with this post than I expected. As I noted in last night’s post, however, the state-based forecast models are all showing an Obama victory in the Electoral College, with very high probabilities. (Keep in mind that the probability of victory is not the same as the predicted margin of victory!) So Drew Linzer is holding steady with Obama winning 332-206, while Sam Wang has Obama up 312-226, although his website promises an update. Simon Jackman’s model is also leaning toward 332 votes for Obama, although that is based on Florida going for the President. That race is still too close call, however, as you can see by this chart. 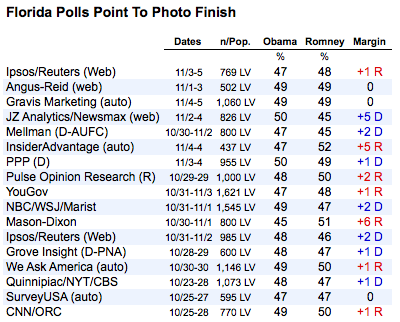 Pollster.com now has Obama up 48.1-46.7% in the national polls. 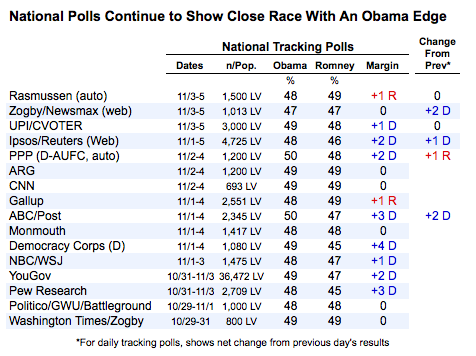 RealClearPolitics has the national race tighter, with Obama up 48.7-48.1%. So both the national and state-level polls now have Obama ahead. What might happen to upset these predictions? It would have to be systematic error in the state-level polls. I have said before that the final state poll averages have proved accurate in the past but it is possible that they are underestimating Romney’s support – or overestimating Obama’s. In short, there would have to be a turnout differential that the likely voter screens are systematically missing for Romney to win this race. Certainly the Republicans are more enthusiastic relative to Democrats than was the case four years ago, and Romney’s organization is not facing a resource disparity vis a vis Obama’s either. I could see the case for why that might boost his final support a bit higher relative to Obama’s than the polls are indicating. But how much higher? Let us assume the polls are understating Romney’s support relative to Obama’s by 2%. If we reduce the gap by that much, that would clinch Florida for Romney and bring Colorado and Virginia into virtual ties. But even if we give all three states to Romney – and assume he wins North Carolina – he still falls short with 257 electoral votes. If we inch up his support a hair more, he might squeak by in Iowa – still not enough. At this point I don’t see Obama losing Ohio. So even the most optimistic assessment of the polls from Romney’s perspective still has this race an uphill climb. A couple of other thoughts. First, I don’t agree that Romney’s decision to run television ads in Pennsylvania was a bluff, or a diversion. I think it made sense. He and Obama have hammered away at each other in Ohio for months, and the state hasn’t budged. In Pennsylvania, however, Obama has much less of a presence, so Romney‘s strategists likely viewed it as a soft target more amenable to stealing. Right now, however, the polls still have Obama up by 5% there, so it is going to take a huge closing surge for Romney to win. Second point to remember: if the first wave of exit polls is released late afternoon – pay them no heed! They haven’t been adjusted yet to take into account turnout figures. Everyone and their cousin has advice on how to read tonight’s returns. To me it comes down to Florida for Romney and Ohio for Obama. If the night starts out with Romney losing Florida, the race is over. If Obama loses Ohio, it’s game on. A reminder – I’ll be live blogging while doing commentary tonight at the Karl Rove Crossroads Cafe. Hope to see you there (if you are local) or online. The GDP Numbers Are In – Do They Say Obama Will Win? The much awaited second quarter GDP growth figure came out yesterday and, while it wasn’t a disaster, neither was it particularly good sign for the economy – or for President Obama’s reelection chances. The government’s first estimate (they often revise the figure as new data comes in) is that GDP grew at an anemic 1.5% – a .5% drop from first quarter growth, and only half of the growth rate experienced during the last quarter of 2011. This downward trend line is not what an incumbent president wants to see heading into an election. As you know from reading my previous posts, GDP growth is one way of measuring one of the key “fundamentals” – the state of the economy – that I have been arguing is far more important to the election outcome than the Bain controversy or Obama’s verbal “gaffes”. But it isn’t the only factor influencing the election, and so we shouldn’t overstate its significance either. Peter Cahill has gathered data on second quarter GDP growth in every election year dating back to 1948, and correlated it with the actual share of the major-party vote won by the incumbent presidential party’s candidate. 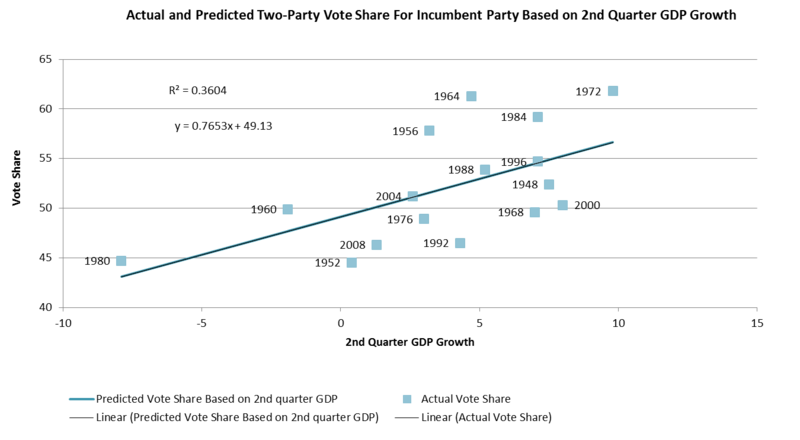 Think of the trend line as the “real” linear relationship between GDP growth and vote share. If we plug 1.5% into the equation defining that line, it predicts that Obama will get about 50.3% of the two-party vote come November based on 2nd quarter GDP growth alone. However, as you can see from the graph, while higher GDP growth generally correlates with a greater vote share, the relationship is not perfect; GDP growth only explains about 36% of the variation in vote share. So a lot of other factors are going to come into play. What are they? As I discussed in yesterday’s post for the Economist’s DIA blog, Emory political scientist Alan Abramowitz’ “Time for A Change” forecast model adds three additional variables to second quarter GDP growth: the incumbent’s net approval (approval minus disapproval) in the Gallup poll at the end of June, how long the incumbent’s party has held the presidency and – in a recent innovation – a “polarization” term that takes into account the increased polarization of the electorate since 1996. With yesterday’s GDP release, all the figures are in place for Abramowitz to predict Obama’s share of the major party vote come November. By plugging the relevant numbers into the Abramowitz forecast equation, it spits out Obama’s predicted share of the major party vote come November as 50.5% – not much different from our estimate based only on second-quarter GDP growth. Based on the confidence interval around this prediction, Abramowitz estimates that if history holds Obama has about a two-thirds probability of winning the election. This is an estimate, mind you, based on data from a small number (16!) of previous presidential elections. But I would argue that it is better than a guess – Abramowitz’s model has performed generally quite well in out-of-sample forecasts, coming within 1.5% of the actual vote about three-quarters of the time. On the other hand, I wouldn’t bet my kid’s tuition, based on this one model, that Obama will be victorious. In short, it is telling us what pretty much every other indicator suggests: that this is going to be a very, very close election but that Obama can be considered a very slight favorite. So, does this mean the outcome is already in the bag, and that what happens from here on out doesn’t matter. Not at all. Campaigns do matter – see my previous posts here and here. And in terms of consequences, in such a close election, they arguably matter even more this time around. Abramowitz’s model, of course, is only one of several constructed by political scientists and, as I discussed in my Economist post, his recent change to his model is not sitting well with everyone. (I’ll discuss this in a separate post.) By my count, there were more than a dozen econometric-based forecast models in 2008. Although they were all, save one, able to predict Obama’s victory, they weren’t equally reliable in forecasting the actual popular vote (although they did pretty well in the aggregate). And, of course, as we get closer to the actual election, none of them will be as reliable as simply aggregating the public opinion polls, which is what Sam Wang, Nate Silver and others will end up doing. So why discuss them at all? Because the best ones remind us that there is a context to this election which largely determines how it will turn out. And right now that context is saying that this election may be too close to call. Changing the Abramowitz Presidential Forecast Model: Is It Science? Beginning today I’ll be posting on a weekly basis (or more frequently) over at the Economist‘s Democracy In America blog site. My first post, addressing Alan Abramowitz’s recent changes to his presidential forecast model, is up there now (here). Although I can’t cross-post anything I write for the Economist here, I will be sure to put up a link whenever I post there, and I encourage you to take peek. As you might expect, given the Economist’s audience, I may have to be just a bit less irreverent and insouciant (you aren’t likely to see an entire “conversation”” with Sarah Palin written in palindromes, or political allegories involving Kim Kardashian for example), but otherwise I plan on addressing the same issues, from the same non-partisan perspective, as you’ve come to expect here at the Presidential Power site. And I will continue posting here as well – we’ve built up a pretty good readership over four years and I enjoy the bipartisan and thoughtful nature of the comments and the intellectual exchange. You don’t get that at very many political blogs. So, go take a peek at my inaugural post at the Economist, but remember to check back here for my regular postings. As always, if you prefer to be put on the distribution list for postings here, drop me an email at dickinso@middlebury.edu. Your email address remains private.